You guys ... Breakfast Sundae Bites for National Kids Take Over the Kitchen Day! Did y'all know today is National Kids Take Over the Kitchen Day? There are so many "national holidays," it can be a little overwhelming. But this is one I can get behind. Flynn is now old enough to get in the kitchen with me, and I absolutely love it. Cooking is my favorite thing to do with him. It's something I've gotta get done, and he is really engaged in the activity. A major bonus is that he tries foods he would normally never try ... like green onions. He eats them raw. To celebrate National Kids Take Over the Kitchen Day, I invited Flynn's cousin Kennedy to come over and make Breakfast Sundae Bites. These are made with all natural ingredients and are totally delicious. I have been snaking on these ever since I made them. I can't get enough. The granola-esque oat crust on these Breakfast Sundae Bites is so good and versatile. You could use the recipe for homemade granola bars or the crust on a key lime pie ... the possibilities are endless. The cashews in it totally make it. 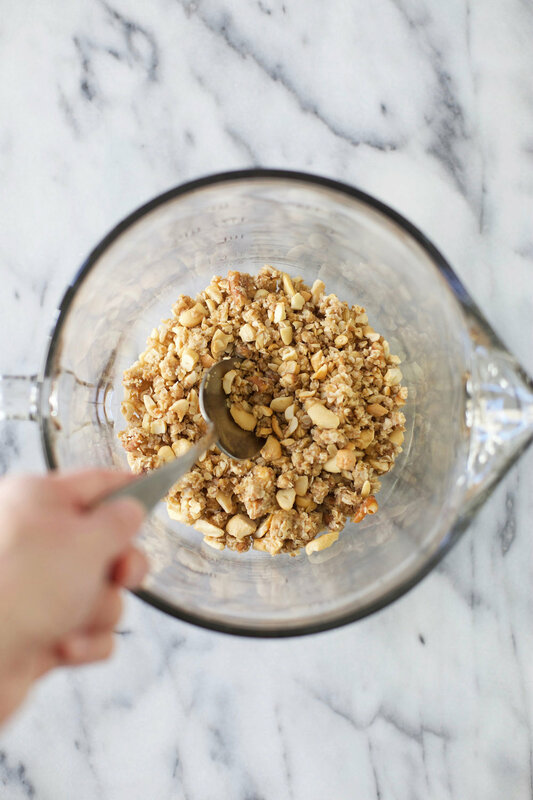 If you use the recipe for a crust, you can blend in the cashews a little more for an even better flavor. The recipe for these Breakfast Sundae Bites is a matter of making the crust and then topping it with your favorite yogurt. This is a no bake recipe. You set the granola cups in the freezer for a couple of hours, and then they are ready to be topped with yogurt and whatever pretty goodies you want. 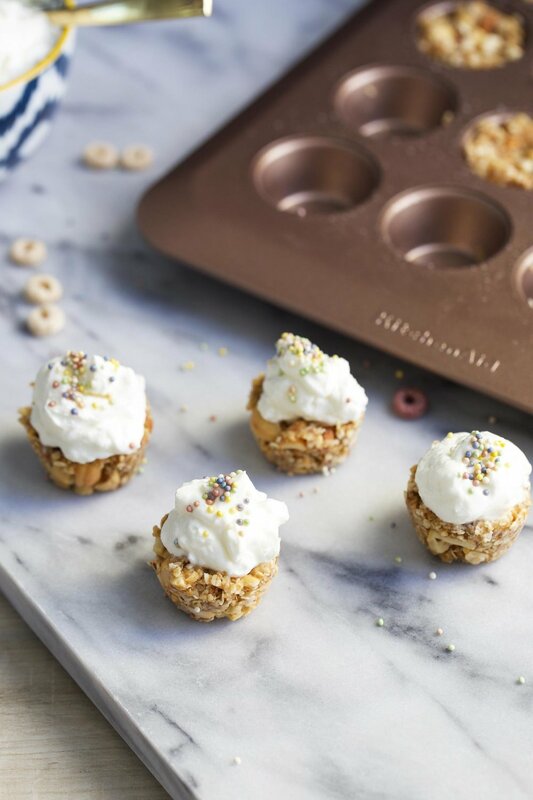 A mini muffin pan makes the perfect shape for the granola cups. Spraying a lil coconut oil on the pan before dropping the crust in makes them pop out with ease. To keep these Breakfast Sundae Bites nice and healthy, I used plain greek yogurt. Flynn is obsessed with "ah-t" which is what he calls yogurt. I'm not sure where he got that, but it is pretty cute when he says it. Here are these Breakfast Sundae Bites in all of their glory before they are topped with some fun stuff. Here is Flynn man and I topping some of the Breakfast Sundae Bites. He had so much fun as did I. He was especially enamored with the honey. He is a big fan of Winnie the Pooh, who as you know loves his honey. He kept calling that honey jar a honey pot. Man I love that guy. Lil fingers in cutie toppings ... is there anything better? If only these chubby hands could stay this way? We used naturally colored "fruit loops" as a topping. They were pretty darn good. I got them at Sprouts. They are dyed with colors from vegetables like beets. My mom was big on not letting us have artificially dyed cereals and foods growing up, so I have carried on that tradition. A lil funny story for you ... she let us all have slurpees one time after we begged her, and we all threw up. I guess it shows you how toxic that stuff can be. Here is cutie cousin Kennedy taste-testing. What would recipe making be without a lil taste-testing along the way right? Food fight! This is my favorite pic of the group. I just love Flynn's expression. It melts my heart. Getting in the kitchen with this guy has truly been the best thing I have done. I can't recommend it enough to have your kiddos cook with you. Apparently it's more fun for kids to be involved in the process rather than getting a plate of food put in front of their faces. Who knew? Aren't these mini breakfast sundaes cute? These sprinkles were made with natural dyes, and they are just as fun ... don't ya think? Hope you guys like this recipe. Let me know if you try it with your kiddos! It would make me so happy. Don't forget to head over to KitchenAid's blog, the Kitchenthusiast for the Breakfast Sundae Bites recipe and instructions. 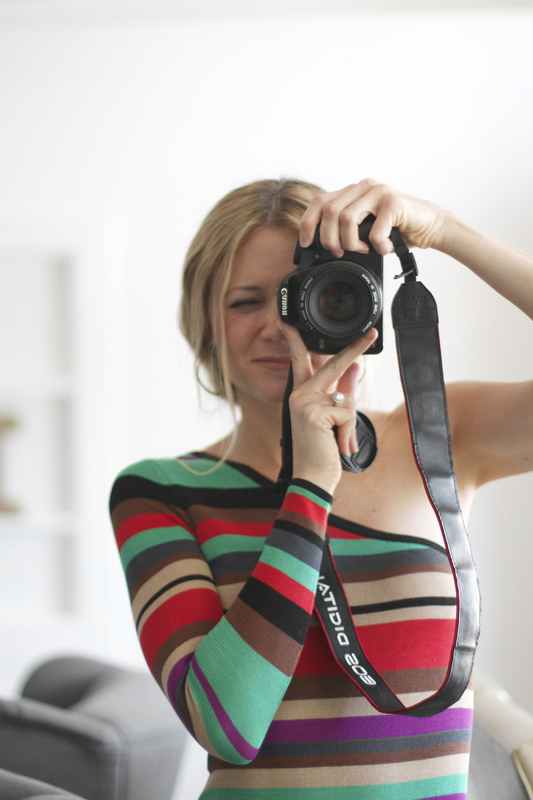 And in case you are interested, here are all of my posts for KitchenAid. Thank you to KitchenAid for sponsoring this post.